Asia equity investors appear to have all the momentum on their side at the moment. 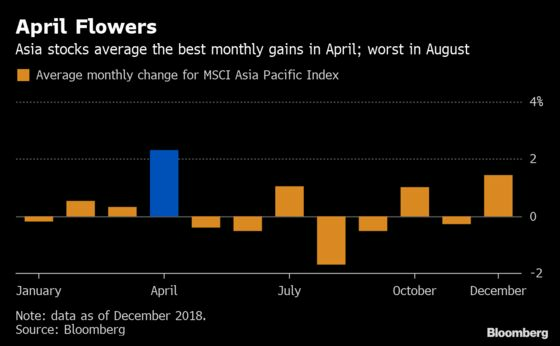 After posting the best three-month start to the year since 2012 -- and top quarter of them all since then -- the MSCI Asia Pacific Index is now heading into its best month of the year, according to data compiled by Bloomberg. Since its inception in the 1980s, the benchmark rose 77 percent of the time in April, with an average gain of 2.3 percent, well ahead of other months. The MSCI All-Country World Index of global stocks also outperformed in April, averaging a 2 percent advance in the month -- but it climbed in April as often as in December. Potential factors for April’s popularity may include a fresh wave of optimism after many companies reported their annual results and outlooks for the coming year, as well as investors looking to squeeze out extra gains before the mid-year swoon. To wit, August is the worst-performing month for the Asian index, falling about 65 percent of the time and averaging a 1.7 percent loss. The question will be whether Asia equities can keep the ball rolling given the outsized gains posted already. China’s Shanghai Composite Index has erased last year’s annual loss with a 27 percent increase since January, in part thanks to trade-talk sentiment turning positive. And Monday alone, India’s stock market is poised to close at a record high, while the Hang Seng Index entered a bull market, coming out of the bear territory it fell into in September. The regional benchmark climbed as much as 1.3 percent to its highest level since early October, with China, Hong Kong and Japan leading the way (all those national gauges are more than 1.5 percent higher). “As far as whether we will see a positive April, I think that is a strong possibility provided the economic data stays on course and we don’t have a breakdown in U.S.-China trade talks,” Jeffrey Halley, senior market strategist at Oanda, said in an email. Factory sentiment in Asia is showing signs of stabilization. Both China’s official purchasing managers’ index published Sunday and a separate private PMI gauge published by Caixin Media and IHS Markit on Monday showed levels back above 50, indicating expansion. Similar gauges also rose in Japan and South Korea. Real estate stocks have also been on a tear recently. The Hang Seng Properties Index extended a record high Monday, pushing its rebound from an October low to 36 percent, as one of the biggest overhangs on the Hong Kong economy also shows signs of a turnaround, with home prices jumping the most in 11 months.